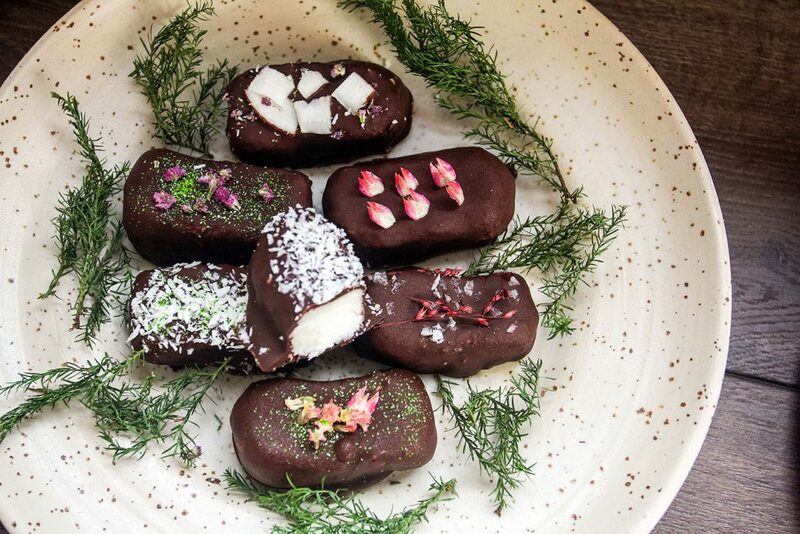 These vegan bounty bars were created because two of my best friends have different types of food allergies. But they still like sweets and honestly who doesn’t like bounty bars? Especially with only the good stuff inside them. They are not very difficult to make but they take a little bit of time the first time you make them. The vegan bounty bars need a food processor to be firm and get the right texture. The first time I made them I didn’t use a food processor and they were not as easy to work with. I have used agave syrup for my bounty bars however, you can use honey too if you like that better. Maybe you need to add a teaspoon honey though as the agave is sweeter than honey. 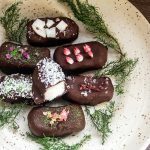 As I mentioned the vegan bounty bars are a little time consuming the first time around but there are a few things that will help you along the way. Put the coconut patties in the freezer for at least 10 minutes. That way they become firmer and easier to dip in the chocolate. I used two tablespoons to help me dipping it in the chocolate. Let the chocolate drip a little. Place the patties on parchment paper and decorate them according to your wishes. 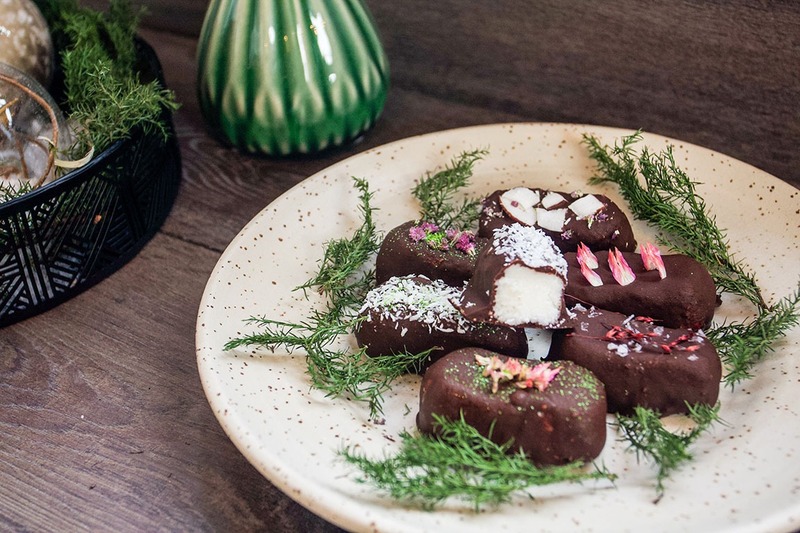 You need to decorate while the chocolate hasn’t set otherwise they will just fall off. I used edible flower petals, (and yes that takes quite a bit of time.) edible glitter and coconut shavings. You can also use sprinkles, cocoa nibs, dried pieces of fruit or why not freeze-dried fruit powders? You can use the microwave to melt the chocolate but I prefer to use the water-bath method. It takes a little more time but, I think the results are better. Especially if you are working with white chocolate or chocolate that is not as dark as 70% or higher. Chocolate is heat sensitive and therefore you need to be careful with the heat. To make this vegan you need a dark chocolate, most 70% are vegan. Just make sure to check the label to make sure. 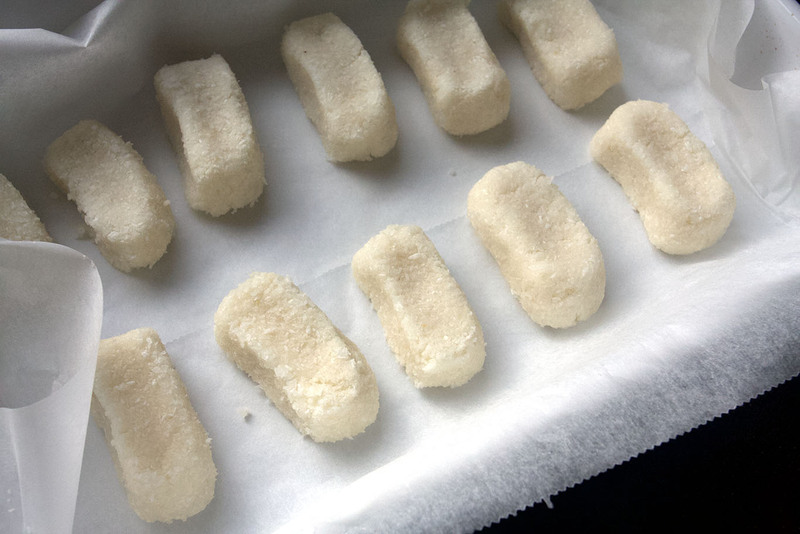 Shape the coconut dough into patties and put them in the freezer for about 10 minutes. They need to be firm. 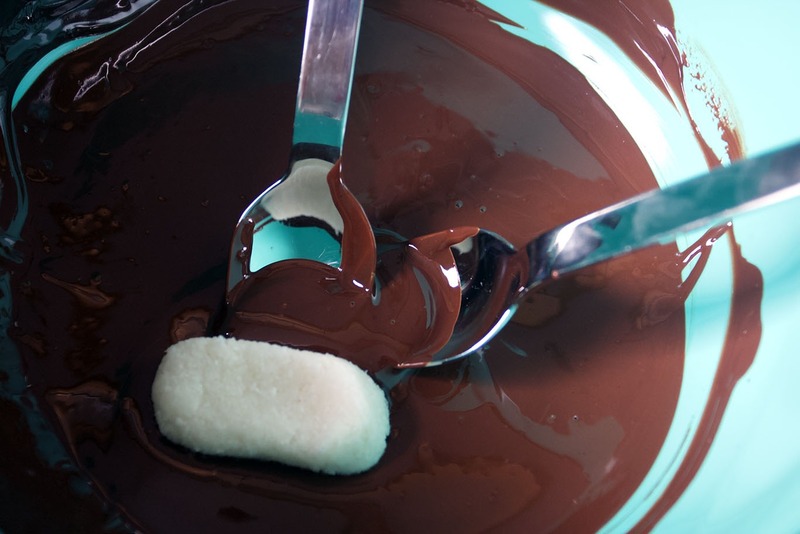 Melt the chocolate slowly over a water-bath. Add 1/2 tbsp coconut oil to make it shinier. Take the patties out from the freezer and gently dip them in chocolate until they are covered with chocolate. Then let them dry on a parchment paper. If you want to decorate them do that now before the chocolate dries. As always, I love hearing from you! Please like, comment or share! If you make them please tag me on Instagram. I love seeing what you create.